Whether it's scoop, non-clumping, LightWeight or alternative, Tidy knows how to make a happy nose. 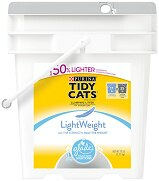 With light, tight clumps, this scoopable litter is all the strength, half the weight. Learn how BREEZE from Tidy Cats is changing the way people think about litter, one box at a time. Tidy wants your home to smell like…well, your home. So it created several scoopable ways to say goodbye to the stink.